"What can the army do with simulators?" Baudrillard's asks. My thoughts wandered as I continued reading to how we simulate soldiers and war through movies and in children's toys. Really, if you look at toys, most of them are simulating a realistic person, place, or thing. These replications of real life are often animated or exaggerated, but why? Why does society make replications of 'war' or a battle for children, but shelters them from the most abundant realities of death and fear and the other components of war besides battle? Toy makers include guns, grenades, possible gestures and body positions that one may actually see in a battle, but there are no dead bodies, faces depicting that soldiers may be angry and afraid, and they do not come with a mechanism to simulate the loud sounds, bright flashes, varying temperatures, etc that are prevalent in battle. Furthermore, these toys are made to fit a certain vision of battle. They do not show the training or any down-time (time that is not directly in battle) that the soldiers have. Children (along with a lot of adults) are mostly exposed to the glorified scenes of battle. 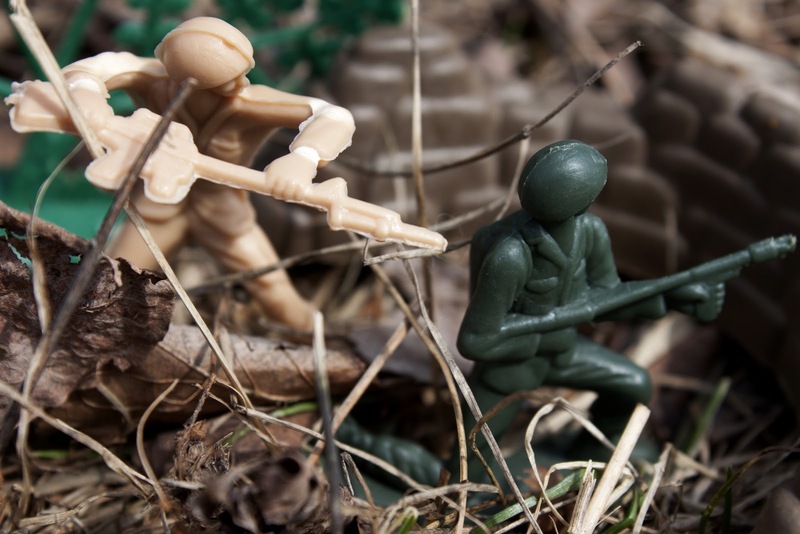 Of course, parents may not purchase a toy that depicts "actual" reality of war, but why should society try to sugar-coat it? Why even make such things available for kids if we are hiding the truth? (Of course, I may or may not be extrapolating and exaggerating some points and questions, but the odd connections are there). My photographs depict a child-like setup of how one may play with these little green men. The settings are outside, on my desk, or on a table with paper-bedding for captive rodents (to simulate dirt and earth). Many of the photographs are supposed to put the viewer into the battle scenes so they are about eye-level with the soldiers. These are the most realistic depictions possible with toys such as these. Rose, You're a genius! I have nothing else to say. 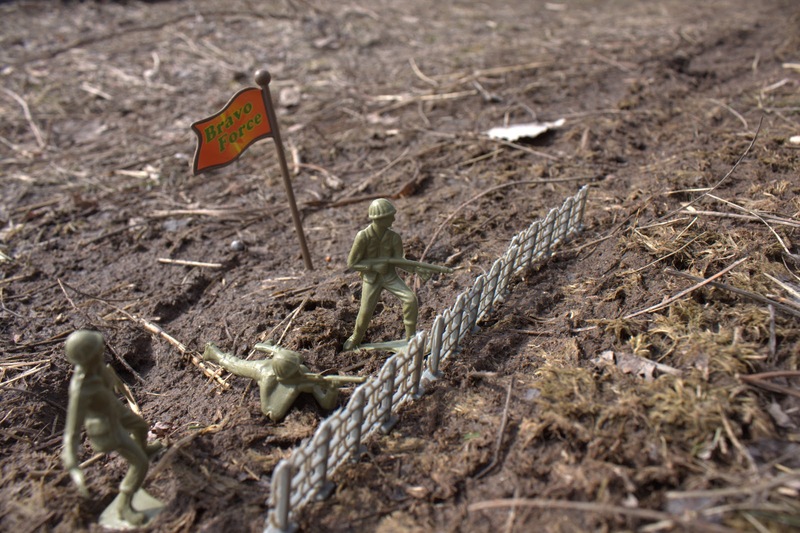 I love the toy soldiers. Such a funny idea. I wish the ones with the hedgehog had turned out.